Panels, Cosplay Gatherings and Autograph Sessions! | NIS America, Inc.
Home / Blog / Panels, Cosplay Gatherings and Autograph Sessions! Can you go to 'em all!? Guess what dood!? We’re back with our full Anime Expo schedule! Check out what we will be doing each day! Below, you will see all of our panels, autograph sessions, cosplay gatherings and even tournaments in one convenient blog post. Not sure who some of the guests we’re featuring are? Check out our guest announcement blog! Come and join us for an exclusive panel featuring the upcoming NISA game Yomawari: Night Alone! We have invited Yu Mizokami, Yomawari’s creator, to sit down and talk about the making of the game, Japanese urban legends that inspired the game’s premise, and to elaborate how the art design makes Yomawari as cute as it is scary. Join us for a spooky session of fun, and be sure to stay till the very end for a THRILLING surprise! With Touhou Project video game titles headed to a console for the very first time, the creator of Touhou Genso Rondo: Bullet Ballet, Yuro, and the creator of Touhou Genso Wanderer, JYUNYA, will discuss how they first delved into the Touhou Project universe and explain their experiences with creating and developing their games. ZUN has created an entire universe…by himself. ZUN is quite the renaissance man, creating a world known as Touhou Project with his company, Team Shanghai Alice, a Japanese doujin game developer specializing in the shoot ‘em up genre. So how does one man manage to be a general producer, game designer, character designer, and a music/sound producer? ZUN himself will discuss how his Touhou Project was created and how it has evolved through the years. Think you got the best bullet hell moves? Let this tournament put your skills to the test! We are proud to host the Touhou Genso Rondo: Bullet Ballet Tournament, where your newly honed skills in Touhou Genso Rondo: Bullet Ballet will be put to the test amongst other competitors! Signups begin June 1st (Friday) at the NIS America Booth (#2605)! First come, first served, so don’t put it off, dood! Three winners will receive an exclusive Touhou Genso Rondo: Bullet Ballet cloth poster, and the First Place winner will receive the Limited Edition of the game! In the Netherworld, on the night of the Red Moon, Prinnies who have paid for their sins get to reincarnate back into humans. At Anime Expo 2016, we are planning to have a cosplay gathering on Saturday, July 2nd, for this special event! Wear your best Disgaea cosplay or Red Moon Day T-shirt to the event and receive a reward! Remember that on each Red Moon Day, only a few Prinnies actually get to reincarnate, so the rewards may be limited. Be sure to attend the Anime Expo 2016 Red Moon Day gathering and show off your Red Moon Day pride so you can receive your commemorative reward. Be sure to RSVP on the official Facebook event page for the gathering and make some friends before you get there! Come meet the creator of our upcoming survival horror game, Yomawari: Night Alone, and get her autograph! Come meet three of the awesome people behind the Touhou universe, and our upcoming Touhou games, Touhou Genso Rondo: Bullet Ballet, and Touhou Genso Wanderer. A magical autograph opportunity like this only comes once in a while, so don’t miss it, dood! What is your Crime Coefficient? How clear is your Hue? Or are you already a latent criminal!? The Sibyl System welcomes you to the PSYCHO-PASS cosplay gathering at Anime Expo 2016! Be sure to RSVP to the official Facebook event page for the gathering and make some friends before you get there! Are you a fan of Danganronpa? If so, you gotta come to this cosplay gathering! Make friends, take photos, and most of all, have fun! (And who knows, maybe Monokuma is lurking around somewhere…) RSVP to the Facebook event page for the Danganronpa gathering now! TOUHOU FANS UNITE! This year, with all the hype around ZUN and our upcoming Touhou titles, nothing is better than a Touhou cosplay gathering where all Touhou fans can get together, make new friends, and take some awesome photos together! RSVP to the Facebook event page for the Touhou gathering now! What are the Prinnies at NIS America up to this time!? If you wanna find out, come and join the Prinny Squad for an exciting panel of fun and games and awesome prizes! Also, we are stoked to bring everyone some news on our upcoming game releases, as well as discussing how JRPGs (like ours, dood!) are continuing to make a big impact in the West. So bring your game on because this will be one helluva panel! We can’t wait to meet you all, dood! 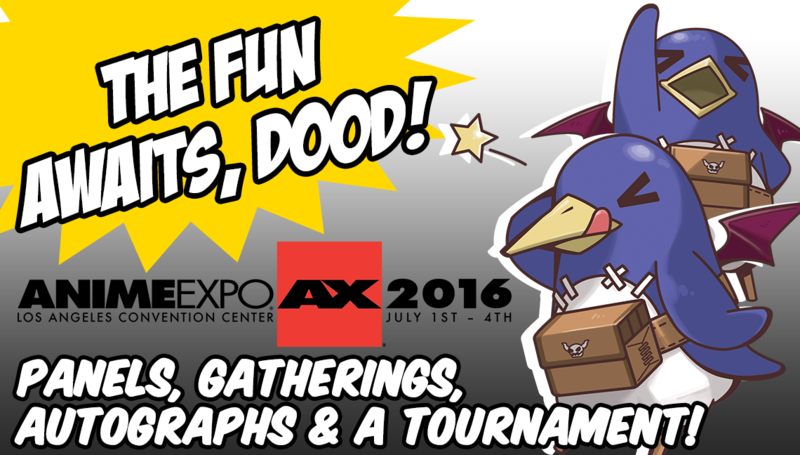 Be sure to check out our full AX Lineup of Awesome at our NIS America AX2016 Website, dood! See you soon!